Padrick started working for Bay Cities Ambulance shortly after his 21st birthday. Since then, Padrick has made his way up from wheelchairs to working full time on the ambulance. 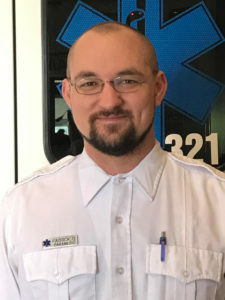 Padrick received his paramedic degree in one of the first paramedic courses offered at Southwest Oregon Community College. Shortly after receiving his degree, Padrick transferred to the Roseburg Division and assisted in growing it into what it is today. Padrick was on the first Bay Cities Ambulance that arrived on scene at the Umpqua Community College shooting and he transported numerous patients that day. Padrick now runs the Supply & Acquisition Department at Bay Cities in addition to his full time duties on the ambulance. Padrick shows dedication, thoughtfulness, and commitment to a job well done each day. Padrick leads by example, and for this reason, Bay Cities Ambulance is proud to call him a Star of Life.